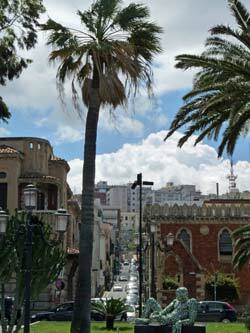 Reggio Calabria is a busy town in Calabria, at the tip of Italy's 'toe' and just over the water from Sicily. Along with Messina in Sicily, on the other side of the Strait of Messina, Reggio Calabria was almost totally destroyed in a devastating earthquake in 1908. The town was rebuilt to elegant plans and - for a port - it is a surprisingly pleasant and amiable place, busy with traffic but rejoicing in a lovely setting. Reggio is a transport hub for ferry services to Sicily, and it is also on the tourist map for its archaeological museum. The town used to be the capital of the Calabria region; now it is merely a provincial capital. It's called Reggio Calabria, or sometimes Reggio di Calabria, to distinguish it from a town of the same name in Emilia-Romagna, known as Reggio Emilia. The Ancient Greek town which stood here, Rhegion, was an important part of Magna Graecia, the Greek colonisation of Italy. The site has had obvious strategic importance over the centuries due to its proximity to Sicily and the shipping route through the Strait of Messina. However, the most important tourist attractions in Reggio are not from the city itself. The two famous Greek bronze statues in the Museo Nazionale in Reggio were found in the sea fifty miles away, near a village after which they are named: the Riace Bronzes, the Bronzi di Riace. These are larger than life-size sculptures of heroic warriors; there is speculation about their origins, creator and significance, but whatever their story, the two heroes are beautiful and rare mementoes from the past. The National Museum in Reggio (Museo Nazionale di Reggio Calabria) is arguably the region's most important tourist destination, and many travellers visit Reggio purely to see the museum. As well as the Riace Bronzes, the museum holds a superb collection of exhibits from Rhegion and other Greek sites in Calabria, including Locri. The bronze statues are in pride of place in a room shared with another lovely bronze sculpture, the head of a philosopher. The museum is closed on Mondays. It's located on Piazza de Nava, at the northern end of the town centre, close to the seafront. The nearest station is Reggio Calabria Lido - for more travel advice, see below. The grand museum building was designed in the 1930s by Marcello Piacentini, the architect of Rome's EUR district. Reggio Calabria's greatest pride, after the statues, is its long panoramic seafront. 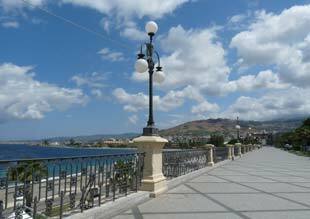 This long wide promenade is a pleasant place to stroll while admiring the view over the sea to Sicily. At a lower level and right on the shore is another walk where there are some 'beach' establishments with sunloungers to rent. A famous phenomenon called the Fata Morgana is sometimes visible from Reggio: a mirage which shimmers in the air over the sea. Historic sights in Reggio are rather sparse, due to the vicissitudes suffered by the town. But there are a few visible ruins visible near the seafront including Roman baths and a stretch of Greek wall. If you are spending time here, other tourist attractions include the municipal art gallery (Pinacoteca Civica), the cathedral (Duomo), rebuilt after the 1908 earthquake, and the Villa Comunale public gardens. Reggio's principal thoroughfare is Corso Garibaldi, running parallel to the seafront a few streets inland, and the central square is Piazza Italia. Reggio Calabria is the final destination for fast Eurostar and Intercity trains heading south down Italy's Tyrrhenian coast from Rome and Naples. It is also served by regional trains which stop at many local stations in Calabria. The town's principal railway station is Stazione Centrale, located on Piazza Garibaldi at the southern end of the town centre. There are left-luggage facilities and a decent self-service cafeteria. A small tourist information office within the railway station is a good place to begin your visit and pick up a free map of Reggio. At the northern end of the seafront, Stazione Lido in Reggio is the most convenient station for visiting the museum or walking to the port. If, however, you are travelling through the town by public transport with suitcases and want to visit the museum, the best thing to do is to arrive at Stazione Centrale, and leave them at the left-luggage office. Then catch a bus (or take a long walk) to the museum. The centre of Reggio di Calabria is served by urban buses run by a firm called ATAM. There are services which connect Stazione Centrale with both the museum and the port. Buses leave from the far side of Piazza Garibaldi, opposite the station, where you can usually find waiting bus drivers ready with advice. Most of the buses heading north stop close to the museum. A less frequent service, the 13, runs right to the waterside at the port, after looping around to the north. Bus number 125 links the port with the airport, also stopping in Piazza Garibaldi. Bus tickets can be bought in a bar by the bus stops. Reggio's port, the Stazione Marittima, is to the north of the town centre, within walking distance of the museum and Stazione Lido. 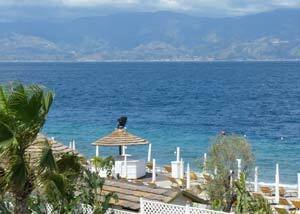 Ferries from Reggio di Calabria head to a range of destinations, with timetables which vary according to the season. The most frequent services are to Messina, opposite Reggio on the coast of Sicily. An efficient fast hydrofoil service run by the railway company Trenitalia departs from a modern, though pretty anonymous, pavilion by the jetties; there are also slower ferries. Daily hydrofoil services - several times a day in summer - to the Aeolian Islands are operated by Ustica Lines. However, note that these are more likely to be disrupted if there are bad sea conditions. A small travel agency by the waterfront (in a portacabin when I visited) sells tickets for Ustica Lines and provides information on these services. From Reggio there are also sailings to Malta. The Italian for hydrofoils is aliscafi. Reggio has its own airport, called the Aeroporto dello Stretto. It mainly serves flights within Italy. The most convenient international airports are at Lamezia Terme, and in Sicily at Catania and Palermo. One of the best short trips from Reggio di Calabria is Scilla, a very attractive fishing village with a beach just half an hour away by train. Further up the Tyrrhenian Sea is the Costa degli Dei ('Coast of the Gods') where Tropea is the most famous resort. Reggio is not the sort of place travellers usually spend much time, but it is a useful staging post on a trip to or from Sicily, or on a tour of Calabria. There's enough to do for a day, with the possibility of further outings or day trips, so if you're looking for somewhere to spend a couple of nights in this area, Reggio isn't a bad choice.